Former Israeli President And Prime Minister Shimon Peres Hospitalized : The Two-Way Peres, 93, suffered a stroke and was taken to a Tel Aviv hospital. He won the Nobel Peace Prize in 1994 for his role in negotiating an interim peace agreement between Israel and the PLO. Former Israeli President Shimon Peres talks to the media after a meeting in Paris in March. 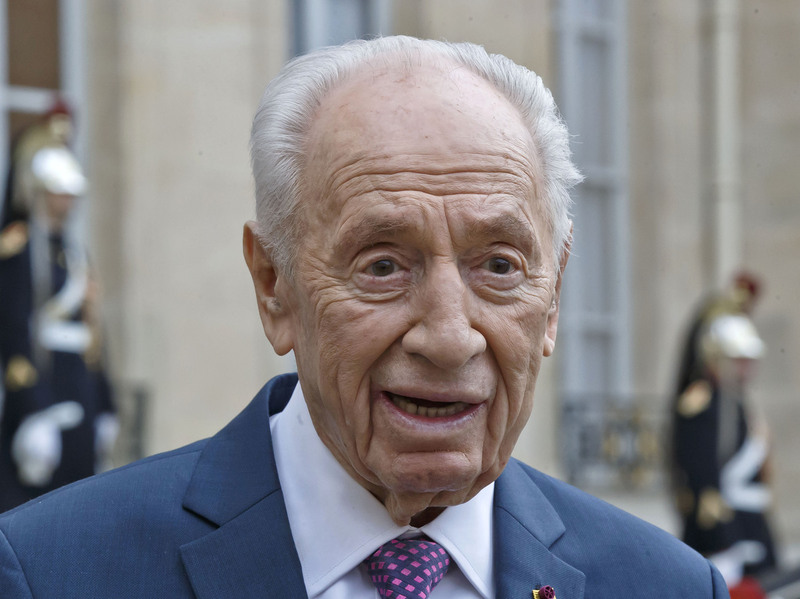 Peres turned 93 last month. Former Israeli President and Prime Minister Shimon Peres, who turned 93 last month, suffered a stroke and was rushed to a hospital in Tel Aviv, according to representatives from his office. "The office of the 9th president wishes to update that the 9th president Shimon Peres has been hospitalized in the Tel Hashomer hospital after suffering a stroke. His condition is stable and he is fully conscious. He is receiving appropriate medical treatment." A short while later, a new statement said Peres had been sedated, placed on a respirator and scheduled for a CT scan. Peres is Israel's most renowned living political leader and senior statesman. According to The Associated Press, he served three terms as prime minister and held the posts of foreign minister and finance minister. In 1994, Peres was jointly awarded the Nobel Peace Prize with then-Israeli Prime Minister Yitzhak Rabin and Palestinian leader Yasser Arafat for their efforts in negotiating the Oslo Accord, the first interim peace agreement between Israel and the Palestine Liberation Organization. Peres served as president, a largely ceremonial post, until 2014. Prime Minister Benjamin Netanyahu's office says he is praying for Peres' full recovery, Daniel Estrin reports from Tel Aviv. "I wish Former President Shimon Peres a speedy recovery. Shimon, we love you and the entire nation hopes for your recovery," Netanyahu said on Facebook.